The perfect drug is crafted, plotted, narrated with lots of research, and hard-working into creating this one whole book. The cover of the novel represents differently than as to the blurb of the book, each has its own way to convey their meaning and essence to reader. The blurb is pretty interesting, one key point for any reader to pick this novel up, as it has very interesting and slightly different content to offer the readers. The story is quiet unpredictable. Ananya, who belongs to middle class family, but indeed good with his studies since school, but yet wishes to be different from others. In becoming that he fetches his time to invent the perfect drug. Making one realise the divinity in terms of reality, one should search the slightest thing from the big, and vice versa. This book is amazingly crafted, you should read it with peace of mind else you end up confusing everything that comes your way. This book also keeps you hooked with this unique plot. There are lot of characters in the book, that leads to huge confusion, the book is elaborated quiet loudly. Yet I loved reading the book, this book also taught me different variations of life in terms of philosophy. For a girl in a star is one such book that leaves impression in your heart even after closing the book. The blurb has given the idea about the book without reveling the much of the story. Reading the blurb it sounded much of daily soap and bollywood sort of story. The cover of the book is quiet pleasant with stars and galaxy, quite my sort of. The title didn’t actually revel much to the ones who read just the title. The language is very lucid, easy to understand, the plot was designed very well. The narration of the story was also great. The story is about two best friends who could possibly do anything for each other, and when they come to bangalore they end up falling for the same girl Arti, then the story revolves around love, emotions, sacrifice, hurt. The twists and turns will keep you hooked up till the last page. It was one amazing read. The blurb seemed very average sort of book, yet I picked up to read and ended completing the book cause unlike the other characters were different. But love bloomed, the story revolves around two best friends taisha and aakash. As its known opposite poles attract each other, that’s how it happened. The childhood friends, on one hand aakash who knows his priorities, dreams and wants to become stand up comedian, on the other hand taisha who is very different to deal with, who is still not aware of her calling, yet wants to be chef. In the journey, they end falling for each other, will they accept the love or turn back? How will they deal with thier own feelings. To know more, grab this book. The title is perfect for the story, the cover is okay ish, the language is very simple and easy to understand, the Hindi language is also used in the book. 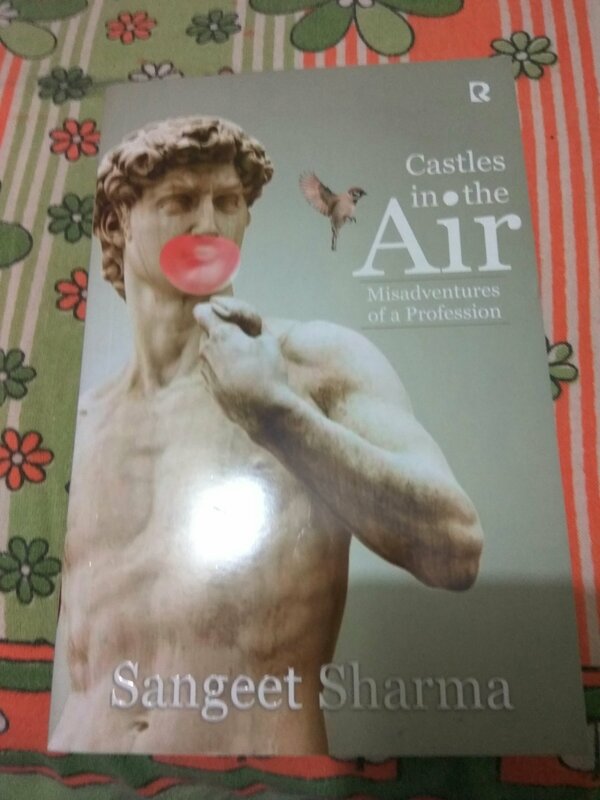 This book talks about architecture. The author has done splendid work in writing about the same, you often tend to miss out what architecture real work is, here is the book that tells you about everything they do, thier life, thier goals, thier schedules, hardwork, prioritising, managing and thier family. The author has shaped a new perspective about the struggle and lives of architectures, which usually we are not aware of . But this book gives you the insight of the struggle and happiness of architectures. It’s definitely turn paging book, the wit, sarcasm, and humor is amazingly written, which is not easy. The characteristics needed more life, nevertheless one good read. Its always architecture what speaks, what people admire, and remember. This book has taught so much and now I have knowledge about architectures too. The cover of book is okay ish, the name of the book seemed very fancy, which I assumed it to be fairy tale, but nevertheless good read. I suggest everyone interested in designing should give read this book. The story is plotted very well, reading the blurb and title you almost already know what’s going to happen. Yet. Yet, the book is inspiring to know your calling, this is what one’s life is based on. The purpose of your life and to attain it, calling of your Soul, passion and purpose stands so important yet unfamiliar to you. Until you seek it, one fine day. The circumstances doesn’t come with invitations, but could act as opportunity if you seek through it well. The story also gives you effective learning through out. Initially I found the story go through lot of dramatic scenes, but with pages, I found the essence of the book. How who helps you when you’re low, how who leaves you when you need them the most is all show thoroughly inside this book. I liked this book, and would recommend many to read this one. It is sometimes unusual to fall for the complete opposite person. Unlike, people always tend to have proper match with the ones who are just like them, whose likings are same in every matter and aspect of life. This book has something different to tell, three different stories where love blooms with sacrifices, commitments, strength. Fights within self ability. There are 6 main characters in this book, who are portrayed and characterised very well. Ritwika and her mother indu, who are more like friends, who is carefree. But Ritwika is disabled but finds someone stable who is not fit in other ways. Her cousin who is orphan who is very introvert. Everyone has a story to convey, set of emotions which will make your strings of attached to their story. Sachin Garg, is an amazing storyteller, his narration skills are brilliant and put very. I liked the concept of the book. The book keeps you glued until the last.